Are you with me? I wish you were because the evening was truly magical.. It probably would have just been enough to float on the Arno river and fall under the enchantment of Florence at night with the calls of the birds of the river, being able to see but not hear the tourists on the bridge, the chink of silverware in some far away restaurant, and feel the boat float as if in a cloud. 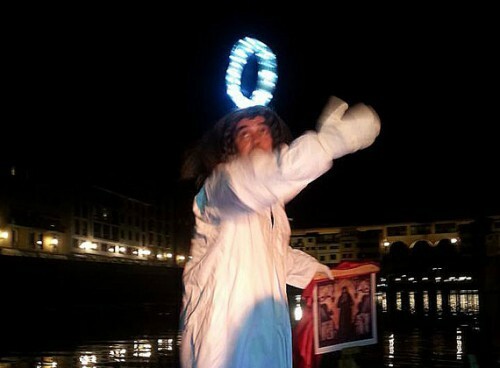 The latest Zauber Theater production (which runs 2,3,4 and 9,10 of September 2015) takes place underneath Ponte Vecchio where the river plays the supporting role to Francesco Mancini and Massimo Grigò as they piece together the story of Florence, Pisa (relationship of Florence and Pisa), the trying life of a Saint in the making and typical Tuscan / Florentine humor. Though I am sure there was a script….or at least a storyline, it was entertaining to watch as the two actors improvised one liners with the unexpected events of working on a floating stage…well actually two floating stages. The audience set out on two separate boats, antique restorations of the boats used to gather sand and gravel from the river boat to build Florence. These boats are pushed through the waters be a “”renaiolo” and a poll which is more than 6 meters long. The direction is an up close peek of the Ponte Vecchio that many never get to see, the underbelly. From a distance we start to follow the (slightly) off key songs of what we find out to be a pirate who has been “let out” of his afterlife for the benefit of boosting the economy of modern day Pisa…only to suspiciously end up in the wrong part of the river. No where near Pisa. He has his own personal stage (boat) and greets us with stories of his colorful…and accordingly to him at least …. infamous past. Then add St. Rainerius who has the (unfortunate) job of reigning in this wayward spirit. The Saint floats on his own stage, and has a surprising good grasp of modern marketing techniques for a man who died in the year 1160. But that is all part of his charm. Their lively conversation, jabs and sense of humor instantly had me feeling as if I were invited to dinner with two good friends who never missed the chance to show each other up in fun and jest. The entire play is in Italian…except when the pirate explains that he ran from Pisa because he wasn’t offered “royalties” on the fame that he was supposed to bring to the city…but even without understanding a word, the joyful setting, the incredible scenery and the magic of floating in the middle of this mighty river while the world happens around you was a memory to cherish all in itself.